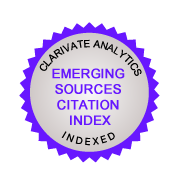 The journals indexed in Emerging Sources Citation Index will not be issued an Impact Factor. However, each journal in this new Index will be evaluated every year and those qualified will be transferred to Science Citation Index Expanded (SCIE). The electronic version (e-ISSN: 2353-5423) of the magazine is its reference. Articles, published in Mining Science, are made available for educational purposes in electronic form on the Web page magazine in the formula Open Access, licenced under the Creative Commons Attribution License (CC BY). Mining Scince. Scientific Papers of the Department Geoengineering, Mining and Geology of the Wroclaw University of Technology. The journal publishes original papers on mining and geology, geo-engineering and the related issues. The journal is devoted to the following topics: fundamental research in mining, underground and open-cast mining technologies, blasting technology, design and construction of mines, geomechanics and geotechnical engineering, mine ventilation, fluid mechanics and its application in mining, mining machinery and condition monitoring, mineral processing, environmental protection and waste utilization. The journal also accepts papers concerns geoengineering which is a sciences covering mining construction, geotechnical engineering, GIS, and earth sciences.